Identification. Guam is the southernmost island in the Mariana Islands chain. The Chamorro people and their language are indigenous throughout the archipelago. Location and Geography. Guam, the largest island in Micronesia, is fifteen hundred miles southeast of Tokyo and six thousand miles west of San Francisco. It has an area of 212 square miles, (550 square kilometers). A high limestone plateau forms the northern regions. The southern region is of volcanic origin, with a mountainous terrain of red clay hills, waterfalls, rivers, and streams. Demography. Guam suffered radical depopulation in the late 1600s, when wars against the Spanish and diseases introduced by Spanish settlers resulted in the death of almost 95 percent of the population. Precolonial estimates of the population of the Mariana Islands range from forty thousand to one-hundred thousand. Spanish settlement in 1668, resulted in a population decline to three thousand by 1700. The population in 1990 was nearly 150,000, a six fold increase since 1940, largely as a result of immigration after 1965. In 1990, only 43 percent of the population was of Chamorro ancestry. The largest immigrant population is from the Philippines, followed by American military personnel and other Asian immigrants. Linguistic Affiliation. The Chamorro language, which is spoken throughout the Mariana Islands, is an Austronesian language. Symbolism. The most enduring symbol is the latte stone, a megalithic structure used to elevate houses in the precolonial period. First built around C.E. 800, latte stones are large coral blocks composed of two pieces: a trapezoidal stone pillar called a haligi, and a hemispherical cap called a tasa that rests atop the haligi. Because construction of these stones was time and labor consuming, their production ceased after the onset of wars against Spanish colonizers. The latte stone has become a symbol of Chamorro strength, pride, resistance, and survival. Emergence of the Nation. In 1521, Ferdinand Magellan landed on Guam. In 1565, Spain claimed the Mariana Islands, but a colonial settlement was not founded until 1668. After four years of conflict, the leader of the Jesuit mission was killed by Chamorros, leading to thirty years of warfare. Spain maintained a colonial presence until 1898, and contemporary Chamorro culture evidences much Hispanic influence, particularly the preeminence of the Roman Catholic Church. In 1898, the United States military replaced Spanish rule as a consequence of the Spanish-American War. For the next fifty years, the United States Navy ruled in a nondemocratic, authoritarian fashion. The entire island was designated a naval base, and villagers were expected to conform to naval standards of hygiene and decorum. No political or civil rights were granted to the people until after World War II. Japanese military forces invaded in 1944. For two and a half years, the Chamorro were forced to provide food and labor to the Japanese military. had taken 42 percent of the land, primarily for military bases, but also for restricted recreational areas. The military still controls more than one-third of Guam's land. In over a century of United States rule, the Chamorro have never had an opportunity to decide their political status. Guam remains a colony of the United States, officially classified as an unincorporated territory. A sovereignty movement has sought self-determination for the last two decades. National Identity. Chamorros have a dual identity as the indigenous people of the Mariana Islands and a part of the United States. The value of inafa'maolek , literally translates as "to make good" and connotes a spirit of interdependence and cooperation. This concept bonds people to the idea that residents can live peacefully and productively when they act in the interests of the group rather than the individual. Ethnic Relations. After the 1970s, ethnic tension between Chamorros and Filipinos became pronounced. Today, there is tension between a growing population of islanders from the Federated States of Micronesia and various indigenous groups. These tensions are exhibited more in the form of racial jokes than in violent acts. The latte stone house is the best known form of traditional architecture. Eight to twelve stones are used for each house, lined up in parallel rows of four to six. The stones range from four to sixteen feet high and weigh forty thousand to sixty thousand pounds. The houses built on top of the megaliths were typically long and narrow. Modern houses are typically concrete structures able to withstand typhoons. Many families live in rural clan compounds where many members of the extended family live in close proximity. The immigrant population dominates the urban areas, living in apartment complexes and condominiums. Food in Daily Life. Food is a significant part of the cultural economy, reflecting an affinity with the land. Sharing food is part of a system of reciprocity based on a sense of perpetual interpersonal obligation. Daily foods include traditional staples such as rice, fish, breadfruit, and taro, in addition to growing quantities of imported foods such as canned goods, and fresh and frozen meats and vegetables, readily available for purchase at local grocery stores. Food Customs at Ceremonial Occasions. Each village celebrates the feast day of its patron saint. These fiestas draw large crowds, with prolific amounts of food prepared for reciprocal exchanges among clan members and friends. Killing a pig or cow and preparing vegetable and seafood dishes are typical aspects of a fiesta. Basic Economy. By circulating items of food and other material goods, and lending support when labor is needed, Chamorros maintain and strengthen links of kin and friendship. During funerals, family members and friends give food, service, and money for nine days after the death. The family of the deceased acknowledges this support by reciprocating with money, goods, or services when those families are in need. Guam's modern economy revolves around a growing cash sector and wage labor employment, particularly in the government and tourist industries. Guam's national currency is the U.S. dollar, and U.S. federal government spending and local government expenditures fuel Guam's domestic spending. Land Tenure and Property. Land traditionally was owned by the clan as a corporate group. During the reoccupation by the U.S. military, almost half the island was taken by the American government. These acts dispossessed many Chamorros, who had few assets other than land. The United States Congress later established private ownership of land. Commercial Activities. Most residents work for wages and there is subsistence farming of bananas, papaya, guava, mango, breadfruit, and taro. The government funded by local taxes and U.S. federal tax transfers employs the largest proportion of the adult population, while hotels, the service industry, and the military also employ large numbers. Major Industries. The tourist industry is the largest private sector source of income. Hotels, restaurants, and entertainment provide for millions of tourists, primarily from Japan. Trade. Imports exceed exports in value by 17 to 1, as almost all of the island's manufactured goods are imported from the United States and Japan. Division of Labor. Both men and women work in the wage economy. In the nonwage sector, men and women share agricultural responsibilities, while men also engage in fishing and hunting. Women have traditionally managed family resources, including land and food. Classes and Castes. Chamorro society emphasizes respect for the elderly. The practice of manngingi , ("to smell") entails sniffing the right hand of an elderly person to express one's deep regard. Before colonial rule, Chamorros recognized the power and authority of clan elders. Informal positions of authority were granted to elders who commanded the respect of their clan members. Elders could pool the labor and material resources of their clans in times of need. The class system has two categories: the manakhilo ("high people") and manakpapa' ("low people"). The manakhilo includes wealthy families from the capital of Hagåtñta who have held positions of power since the colonial era. Symbols of Social Stratification. Class lines are not strict because most clans have members in both social classes, and the rich and the poor tend to live side by side within family compounds in rural villages. Those outside the clan compound may live in modern housing subdivisions that congregate people along economic lines. Government. In 1950, civil and political rights were granted to the Chamorro people through the passage of an Organic Act for Guam by the United States Congress, which also granted U.S. citizenship to the Chamorro. Guam is an unincorporated territory of the United States. Political life revolves around articulating, explaining, and defining Guam's ambiguous relationship with the United States. The Organic Act established a unicameral legislature, a superior court, and a governor. Leadership and Political Officials. Leaders are elected and are predominantly of Chamorro ethnicity. These political officials come from the Democratic and Republican parties of Guam. These parties emerged in the 1970s along cultural rather than ideological lines. Party politics express historical clan rivalries more than differences in political ideology. Social Problems and Control. Uncontrolled population increases have contributed to a diminished level of social welfare in the last decade. Overcrowded schools, hospitals, housing areas, and prisons reflect the social problems of overpopulation. Unresolved land problems, unrestrained immigration, and indigenous rights issues, along with substance abuse and domestic violence, are significant sources of tension. Military Activity. The U.S. Navy and Air Force occupy one-third of the land and account for approximately 20 percent of the population. An air force base, a naval base, and a naval communications center form the largest concentration of military resources on the island. Guam receives welfare assistance from the U.S. government. Additionally, the local government, the Roman Catholic church, and private organizations sponsor programs to assist victims of domestic violence, homelessness, and terminal illness. The American Red Cross and the American Cancer Society have offices on Guam, and privately funded organizations address social and health problems. Indigenous rights groups have gained international status through the United Nations, including groups such as Chamoru Nation and the Organization of Peoples for Indigenous Rights. Division of Labor by Gender. Chamorro culture had a balance in gender roles. Power within the clan belonged to both the oldest son and the oldest daughter. Women traditionally held power over the household, while men conducted affairs in the public sphere, including hunting and fishing. The oldest daughter cared for her parents in their older years. Three centuries of colonialism have created much change, particularly in the public sphere. Men dominate political offices, and women are leaders in many social, religious, and cultural organizations. The Relative Status of Women and Men. After more than three centuries of colonial rule and the dominance of the Roman Catholic church on Guam, the relative status of men and women has changed in favor of higher status for men's roles. Under both Spanish and American rule, men were selected over women to hold positions in any public capacity, whether in the government, business, or church. Women's power in the household has largely been maintained through their control over familial resources, including the paychecks of husbands and children, and the labor resources of all family members. In the past half century, women have successfully found acceptance as elected officials and leaders of numerous government and civic organizations, although men still vastly outnumber women in positions of political leadership. Marriage. The groom's family sponsors the marriage, providing the bride with her wedding dress and other items of value. In addition, they throw a party to demonstrate their ability to provide for their new daughter. Traditionally, upon marriage, the woman was expected to relocate to her husband's clan land, although today this practice often is forgone in favor of whatever housing is available. Domestic Unit. The extended family or clan, is the core of society. The domestic unit can include grandparents, parents, children, grandchildren, cousins, and other relatives. The practice of poksai, a form of adoption, is common. In this system, childless women may raise a niece or nephew and grandparents may exercise parental control over a grandchild. Inheritance. Sons and daughters generally inherit land and other material possessions equally from both parents, with protections extended to the youngest child and any unmarried children. Kin Groups. The closest kin group consists of first and second cousins from the mother's and father's lines and may include godparents and their children. The system of clan names allows Chamorros to navigate relationships despite an abundance of duplicate surnames. Clan names reflect kinship along male and female lineages in ways that surnames do not. Persons with different surnames may share a common clan name, revealing a relationship along the lineage. Generally, people place priority in the mother's clan line. Infant Care. While biological parents and grandparents are the traditional providers of infant care, the larger extended family provides a network of assistance. People show great affection to infants, frequently smelling and lightly pinching, squeezing, and biting babies. Chamorros believe that feelings of matgodai have such spiritually powerful effects that failing to demonstrate affection can make a baby cranky or cause illness. Child Rearing and Education. Nearly all the major events in a young person's life revolve around celebrations in clan circles. Children are socialized from birth to show respect to their relatives. While the extended family provides a network of assistance for child rearing, some working parents place their children in day care or preschool. There is mandatory schooling from ages five to sixteen. Higher Education. The University of Guam is the only four-year accredited institution of higher learning in the western Pacific. Most of its students are graduates of Guam's high schools. Respect for elders and authority figures is a core cultural value. Chamorros demonstrate respect by bending over and sniffing an older person's right hand. Religious Beliefs. Chamorros believe that their ancestors have lived in the Mariana Islands since the dawn of time. In this world view, the Mariana Islands lie at the center of the universe and all human life began in Guam. While almost all residents are baptized into the Roman Catholic faith or belong to another Christian denomination, animistic beliefs persist, including a respect for ancestral spirits, or taotaomo'na, who are believed to occupy certain trees and other areas in the forests. Persons entering the jungle are expected to ask permission from the taotaomo'na and remain quiet and respectful. Those who offend the taotaomo'na may receive bruises or suffer from inexplicable ailments. Religious Practitioners. In precolonial days, persons referred to as makahna mediated between the spiritual and physical worlds. While Spanish Catholic missionaries abolished these practices, many persist. Viewed primarily as herbal healers, suruhanu and suruhana also function as healers of those with a variety of illnesses. Rituals and Holy Places. Jungle areas and sites in which latte stones are located are considered sacred. In precolonial years people buried family members beneath latte stones and thus ancestral spirits are assumed to reside there. Ritual behavior in the presence of latte stones or in jungle areas includes maintaining quiet and decorum and showing respect for the environment. Death and the Afterlife. Many Chamorros continue to observe ancient animistic beliefs. The acceptance of the taotaomo'na "people of before" reveals an enduring belief in the existence of persons' spirits beyond their physical life. Many families tell stories about visits from a deceased relative whose presence has been made known through scent, touch, or appearance. Every year on All Soul's Day, Chamorros remember their ancestors by holding special memorial services and decorating their graves with flowers, candles, photographs, and other mementos. Since World War II, American-trained and licensed doctors and nurses have been the prevalent health care professionals. Chamorro health care specialists continue to practice health care, using a variety of homemade herbal medicines and massage techniques. American colonialism introduced secular celebrations such as Veterans' Day and Martin Luther King, Jr. Day. The most widely celebrated secular holiday is Liberation Day, commemorated each year on 21 July to observe the retaking of Guam by the U.S. military in 1944. A parade with floats and marching bands is staged to honor military veterans and Chamorros who lived through years of wartime terror. Support for the Arts. The Guam Council on the Arts and Humanities, funded by the government of Guam, and the Guam Humanities Council, funded by the U.S. government, sponsor a variety of cultural activities. Public radio and television stations encourage the arts. Public and private art galleries include the Isla Center for the Arts at the University of Guam and the Puntan Dos Amantes Gallery. Literature. As a culture rooted in oral traditions, Guam has little written literature. A few Chamorro novels have been published. A literary journal published by the university's literature faculty motivates poets and other creative writers. Graphic Arts. There exists a growing community of local artists, particularly in the fields of painting and woodcarving. A number of locally owned arts shops, such as the Guam Gallery of Art and Jill Benavente's Mangilao store, feature a wide variety of locally produced art pieces. Performance Arts. The University of Guam's Fine Arts Theater, Southern High School's Performance Center, and the Tiyan Theater are popular venues for locally written and produced plays and musical performances. Support for the physical and social sciences comes primarily through the University of Guam's annual College of Arts and Sciences Conference, the annual High School Science Fair, and the university-sponsored journal Micronesica, which publishes scientific research. Carter, Lee D., William L. Wuerch, and Rosa Roberta Carter, eds. Guam History: Perspectives, Volume One , 1997. Cunningham, Lawrence J. Ancient Chamorro Society, 1992. Hale'-ta: I Ma Gobetna-ña Guam, Governing Guam: Before and After the Wars, 1994. Hattori, Anne Perez. 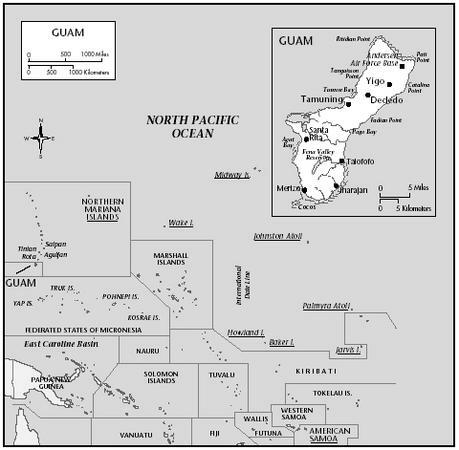 "Colonial Dis-Ease: U.S. Navy Health Policies and the Chamorros of Guam, 1898–1941." Unpublished dissertation, University of Hawai'ii at Manoa, 1999. Pacific Island Profiles , 1995. Rogers, Robert F. Destiny's Landfall: A History of Guam , 1995. Russell, Scott. Tiempon I Manmofo 'na: Ancient Chamorro Culture and History of the Northern Mariana Islands , 1998. Sanchez, Pedro C. Guahan Guam: The History of Our Island , 1989. Souder, Laura Torres. Daughters of the Island: Contemporary Chamorro Women Organizers on Guam, 1992. Wei, Debbie, and Rachel Kamel, eds. Resistance in Paradise: Rethinking 100 Years of U.S. Involvement in the Caribbean and the Pacific, 1998.
please enjoy my culture. we are a wonderful people. Chamorro by blood and chamorro by birth. Thank you for the referrence. I was looking for wedding traditions for our culture, specially the exchanging of the 13 silver coins and vail drapped acrosss the bride and groom. My son and his family live on Guam. I plan to visit them soon for the first time and needed to know more about the culture of the original Chamorro inhabitants of Guam. I enjoy learning as much as I can so not to offend anyone during my visit. Thank you for taking the time to build this site and for the education it supplied me with. I'm sure that I will enjoy Guam much more now that I understand some basic cultural pieces. what about chamorro fiestas, because i need to knowo about how the fiestas began on Guam. This is great, reminds me of my culture. My culture and Chamorro culture got lots of similarities. i want to know, how about muslim people? im muslim and i want to visit guam. Though I am not chamorro, I love the chamorro culture! I grew up on Guam and I love eveyrhting about it! I represent Guam more than my originated country! Biba Chamorros and Guamanians! Thank you so much for this amazing page it was so helpful because everyone in my my 6th grade class is doing a project on a country and I chose Guam!! Anyway I'd like to give a big thanks to anyone who even helped out with this page, it was a big help. this website helped me alot on my projest for ceramics, thanks to whoever did this. i really thank you for it. Thanks a lot for the excellent info about guam. It has helped me in preparing a project as well know abt the country. This is very accurate. I am Chamorro and I was born and raised on Guam and what is mentioned here is correct. Thank you for that. It is hard to find something about Guam that is accurate. Makes me mad sometimes how people think our culture is when it is actually no where close to what they assume.. I am doing a report on communications in Guam such as how their nonverbal and verbal gestures differ of those in the US. I was wondering if anyone knew of any good websites or links to help me with my research. I am trying to learn alot about Guam for my project. You guys have a cool culture. It is so cool that people in my class is trying to research about this place. I just want to thank you for the knowledge and concepts of the Chamorro culture. I am trying to locate my relatives. My biological father and his brothers were born on Guam. Their names Bernabe Aguon Sanchez, Justo A. and Juan Aguon Sanchez. My father is Bernabe. He also has 4 children who were born before me. If anyone has any information please e-mail me. My daughter is Chamauli ( Chamorro / white ) so am I suppose to celebrate her 15th birthday or 16th ? People keep telling me I need to throw her a quince era party for turning 15! I'm confused! Help! What is the Chamorro tradition for birthdays? Can someone either show me a picture of what our grandmother's and their mothers wore back in the olden days especially for a special event? I was just wondering if it is safe for women to travel alone. I am 47 and travel a lot. What is your suggestion if I want to travel and visit the country to get to know more about the country, food, religion and culture. I am writting a report on the business culture of Guam. Any help would be appreciated. Hi. I was stationed in Guam from 86_89, and I consider it my favorite place during my career. The people are great, the weather nice (even when it rains-a lot) the ocean spectactular (love diving there). Just so expensive. If it were not do, if retire there and live forever. Guam is a wonderful place to visit. so many places to see. I been here my whole life .